1. Place pear halves, cut side down, on cutting board. Starting about 1/2-inch from stem end, make 7 lengthwise cuts in each half, cutting to the bottom. Arrange pear halves, cut side down, in 11 x 7-inch baking dish. 2. In small saucepan, combine next four ingredients. Cook over medium heat, stirring constantly, until sugar is dissolved. Pour sugar mixture over pears. 3. Bake covered, in preheated 350°F oven until pears are tender (40-45 minutes). Baste pears with sauce. 4. 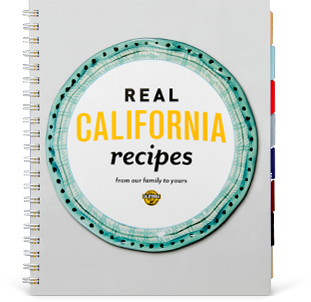 To serve: Stir Real California Crème Fraîche; spread two tablespoons onto one half of each dessert plate; spoon one tablespoon sauce from pears on the other side. 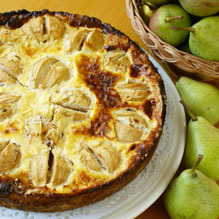 With slotted spoon, place pear half in center of each plate; garnish with almonds, if desired. Serve immediately.